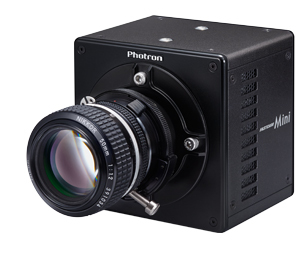 Using innovative proprietary CMOS image sensor technology, the FASTCAM Mini UX achieves high light sensitivity from a small image sensor (10μm pixel pitch) through the utilization of microlenses to increase effective Fill Factor. At maximum image resolution the image sensor is fully compatible with readily available 1-inch C-mount lenses offering a wide choice of small, light weight, rugged and high aperture objective lenses. The FASTCAM Mini UX features a rugged design suitable for operation in high shock and vibration environments and a compact camera body (120mm x 120mm x 93mm) weighing just 1.5kg.This small and rugged camera design makes the FASTCAM Mini UX ideally suited to on-board and off-board automotive safety testing and many other applications where a compact size and compatibility with standard optical systems is required.